Before you launch coupon functions in Posts, you must add some small preparations. To add coupons manually, go down in Post edit page and find Post Offer section. Required fields for coupons are Url and Coupon text. You can add there coupon code, expiration date and also enable Reveal function (coupon button will hide coupon and it will be visible only on click which will trigger pop-under). But, usually, users add coupon with bulk import tool, because most of affiliate networks provide coupon feeds. You can assign coupons also to woocommerce products. Make your product a External type and you will see additional fields. As Alternative, you can use Coupon Module of Content Egg (available in free bundled version of plugin). 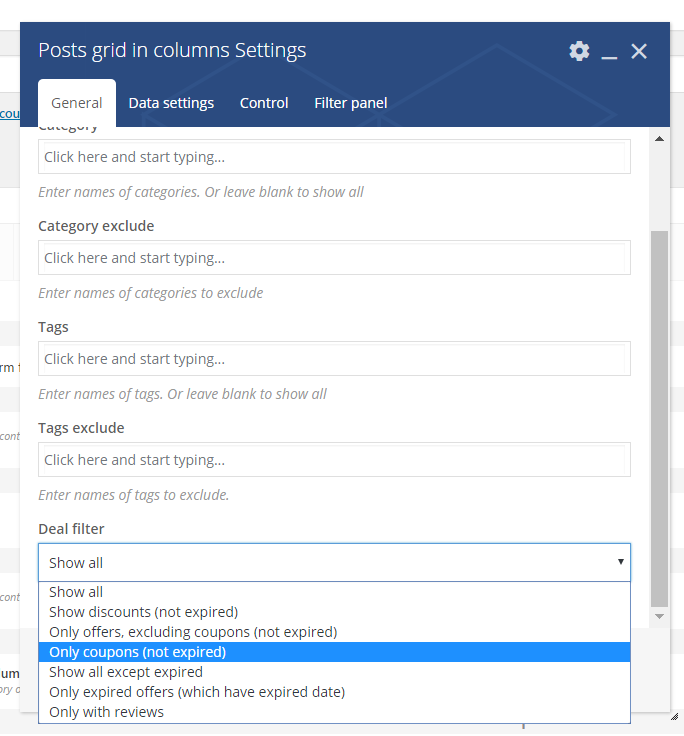 If you have coupons only in some categories of posts and you want to show all of them as separate block of page, use Visual Composer page builder All Post modules have option to sort coupons. When you use bulk import tools you, maybe, don’t have product image. Usually, this happens when you import different coupons and offers. Very often, coupon feeds don’t have any product image. So, for this, you may want to show brand logo image for such posts. (How to add brand (store) to post). Then, go to Plugins – add new and upload this file, then activate it (RH Fallback image plugin).